Edward Thomas McCaffrey (born August 17, 1968) is a former professional American football player who was a wide receiver in the National Football League (NFL) for thirteen seasons. McCaffrey played college football for Stanford University and earned first-team All-American honors. The New York Giants chose him in the third round of the 1991 NFL Draft. He also played for the San Francisco 49ers and Denver Broncos. Born in Waynesboro, Pennsylvania, McCaffrey played high school football at Allentown Central Catholic High School in Allentown, where he competed in the East Penn Conference in Pennsylvania's Lehigh Valley. He played college football at Stanford University in California, and as a senior in 1990 was an All-American. At Stanford, he was a member of the Sigma Alpha Epsilon fraternity. McCaffrey was selected by the Giants in the third round (83rd overall) in the 1991 NFL draft. During his thirteen-year career, he won three Super Bowl rings (Super Bowl XXIX, as a 49er; XXXII and XXXIII, as a Bronco) and made a Pro Bowl appearance in 1998. At Denver, he became a reliable target for quarterback John Elway, set a Broncos record for most receptions in a season (with 101 receptions in 2000), and had an exceptional performance in Super Bowl XXXIII, recording five catches for 72 yards. Also in 2000, McCaffrey and teammate Rod Smith became only the second wide receiver duo from the same team to each gain 100 receptions in the same season (see Herman Moore and Brett Perriman). 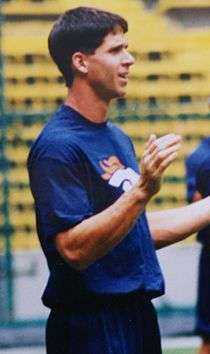 On September 10, 2001  (the opening game of the 2001 season for the two teams), McCaffrey suffered a compound leg fracture while playing a Monday Night Football game with the Broncos against the Giants. He rebounded in the 2002 season with 69 receptions and 903 yards. Hampered by injuries during a disappointing 2003 season, McCaffrey retired on February 29, 2004, He finished his career with 565 career receptions for 7,422 yards and 55 touchdowns while wearing the number 87. McCaffrey is the oldest of five children, with two brothers and two sisters: Monica of Georgetown University Women's Basketball, Billy McCaffrey, a former Duke and Vanderbilt college basketball player, Michael and Meghan. McCaffrey began coaching youth football camps in the summer of 2000. In 2011 he founded SportsEddy, which includes not just football but lacrosse, soccer, baseball and basketball camps. The Ed McCaffrey "Dare to Play" football camp and the "Dare to Cheer" cheerleading camp for individuals with Down syndrome are produced in partnership with the Global Down Syndrome Foundation. McCaffrey also founded the McCaffrey Family Foundation with wife Lisa, to assist children whose medical situation has created an academic or financial hardship. He also has his own brand of mustard and horseradish sauce, which can be found in supermarkets across Colorado and into Nebraska. On July 30, 2012, McCaffrey was named the new color analyst for 850 KOA, flagship station of the Denver Broncos Radio Network, replacing Brian Griese. McCaffrey met his wife Lisa (Sime), daughter of Olympic sprinter Dave Sime, while they both attended Stanford University. Together, they have four sons who also play football like their father. The oldest son, Max McCaffrey, had at one point played in the NFL, but is currently a free agent. Christian McCaffrey is a junior running back for the Stanford Cardinal and was the runner-up for the 2015 Heisman Trophy. Dylan McCaffrey is a 4-star quarterback for Valor Christian High School, set to graduate in 2017. As the second-ranked quarterback in the country and top-ranked quarterback in Colorado, Dylan received scholarship offers from Duke, Colorado, Rutgers, LSU, Michigan, Washington, UCLA, Colorado State and Penn State. Dylan announced on February 15, 2016 that he had committed to the University of Michigan. The youngest son, Luke McCaffrey, is currently a freshman at Valor Christian High School. ↑ Branch, John (2005-10-23). "Nightmare Eve, the Game Before 9/11". The New York Times. ISSN 0362-4331. Retrieved 2015-11-08.